“That guy” is someone whose face and 6 foot 3 build people recognize from dozens of well-known movies and television shows (Ghostbusters II, Wayne’s World, Psych, Supernatural), but whose name escapes them. Being that guy means getting approached by strangers roughly 10 times a day, often by people who know they know Kurt, but can’t figure out why they recognize him. 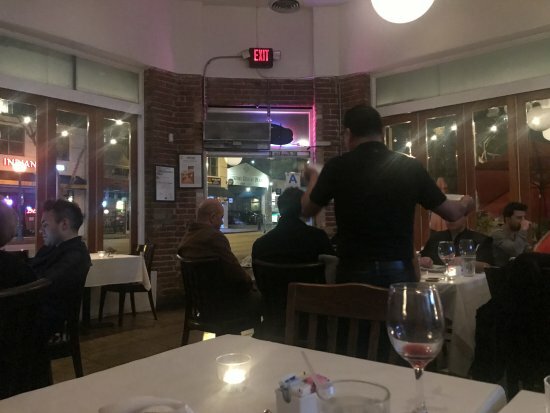 For more than two hours — “my god, it felt much longer,” he’ll quip at the end — the wry, charismatic, charming and eloquent man sitting across from me at an Italian restaurant shares stories about his lengthy acting career. We touch on a wide range of topics, from how he got started in acting to the future of the industry, and from Hollywood’s sexual harassment scandals to what he’d be doing if he had to pick a backup plan and quit the industry. And he even helps with trying to come up with a headline for the interview based on puns about his last name. 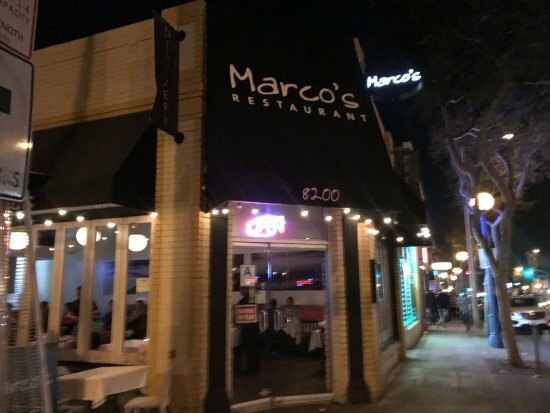 We’re dining at Marco’s Trattoria, a restaurant Kurt’s been wanting to try for a while. “This is a nice place, this is a good place to talk,” he says. And he’s right. Music plays at a very subtle level in the background, and the ambient noise level is soft. The building itself is decorated in a simple manner. Exposed brick walls, large pictures of landscapes on the wall, dark chairs and white tablecloths. Browsing the standard fare like lasagna and spaghetti, Kurt says, “I’m trying to eat better. I was just on location in Montreal, and when you’re on location, you eat terribly. Montreal is a heavy meat town, you can’t get a light meal there.” He was in the city for almost five months filming a 10-part series for EPIX based on Joël Dicker’s novel The Truth About the Harry Quebert Affair. “It’s a mystery, it was a bestseller, and I play an important role,” he says cryptically. That guy has played memorable roles in almost countless movies, from the New York City mayor’s plotting aide in Ghostbusters II to television director Russell Finlay in Wayne’s World, and in television shows from the offbeat coroner Woody Strode in Psych to the recurring role of Judge Peter Dunaway in The Good Wife. His is a face many viewers instantly recognize. Kurt says that although he is established enough that he doesn’t audition much these days, he will still read for parts which some people think he can’t do. “So I read for them – I don’t get many of them because preconceived notions are very strong,” he says. But there are exceptions, like the role he disappears into for the upcoming The Truth About the Harry Quebert Affair. This March, he’ll also be seen as the principal in Paramount Network’s television series version of Heathers, based on the dark comedy movie of the same name about a mean high school clique and a place where a student commits suicide every week. “It’s very funny, and as long as I can do things that skew younger I can keep working,” Kurt says. He adds, “It’s only taken me 25, 30 years to figure out how I’ve been overacting my whole life,” he says. Now he can spot it, comparing overacting to someone telling a story in an incredibly loud bar, as he waves his hands theatrically in the air and talks in an over-animated way. Kurt’s dry humor is clear from the moment you meet him. He’s great at effortless adlibs. And he appears relaxed as soon as we meet. Which is probably how I get so comfortable around him that my hidden clumsiness comes out when the waiter deposits some bread. I want to dip the bread in vinegar and olive oil and grab for the bottles, but they end up sending streams of liquid his way. Instead, at my urging, he launches into a condensed biography. Kurt was born in San Francisco on September 16, 1953. “Our family motto was, ‘We’re the Fullers, we rise to the middle,” he says with a smile. If that’s the kind of line his parents would speak, it’s easy to see from where he got his dry, sometimes self-deprecating and always winning humor. Our waiter returns with our starter, we’re both having the pasta fagioli. I pull out my otherwise abandoned iPhone to take pictures of the soup, and earn my first eye-roll of the night from Kurt, something that will become a running gag for each snap. After clicking away, I sample the soup and am happy to taste that the meal’s off to a good start. The soup of white beans, rosemary and pasta soup is served in a large square bowl, almost too much for an appetizer. But the hearty soup is so delicious it’s impossible to not finish it off. “Mmm, this is good,” Kurt agrees. 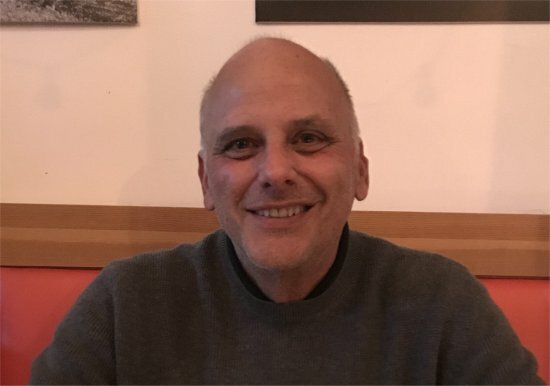 In-between spoonfuls, he goes on to tell me that after graduating Berkeley in 1976, he chose Los Angeles over the other main acting city of New York because he figured it was better to be poor in the sunny city of Angels than the seasonal Big Apple. Worst case scenario he could eat oranges and the weather would be better. Packing everything he owned into a 1967 Dodge Durango (including his mattress), he drove south with no grand master plan and no contacts in show business. In the early days he’d work during the day and act at night, fitting in auditions. He was a bank teller, then sold shoes, then real estate. By the way, he didn’t get that part. Celebrities like Jack Nicholson, Joan Rivers and Johnny Carson came to see it. But the most fateful celebrity in attendance was actor/director/writer Harold Ramis. He and Dan Aykroyd had written the role of Jack Hardemeyer, a manipulative aide to the mayor in the then still-unmade Ghostbusters II. Harold suggested Kurt try out for the part. He got it, and exploded into visibility. Then along came the television series Psych. The detective comedy-drama ran from 2006 to 2014 and Kurt played the role of the somewhat unhinged coroner Woody Strode. 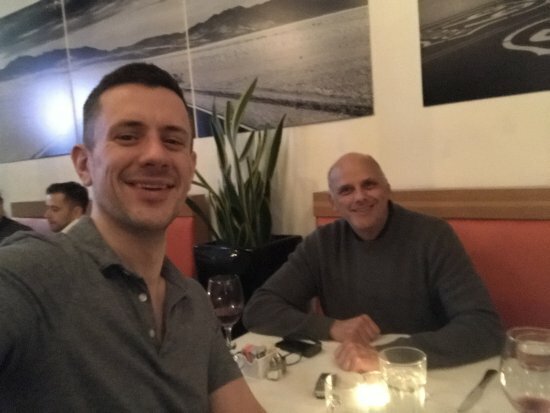 “Psych is the best job I’ve ever had,” he says as the waiter clears away our soup dishes. “It was enjoyed by literally dozens of rabid fans” known as Psychos, he adds. A reunion movie took place last year, and Kurt says more are planned. He loves that the show gave him the chance to improvise and get away from the typecasting of past roles. Reinvigorated by acting, Kurt is still out there looking for interesting parts that test his skills. “I hate rejection, I hate giving really good auditions and not getting it, it still upsets me,” he says. In his earlier years he used to think about acting all the time. But as he gets older he realizes it doesn’t require that much thought. Instead, what it requires is undivided attention. And on that note, Kurt flips me the bird. That’s because I’m reaching for the iPhone again to take pictures of our main courses. 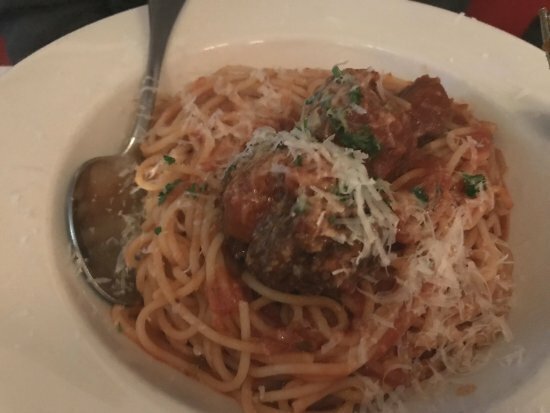 Kurt’s eating the spaghetti with meatballs, served in tomato sauce. Another large portion. My plate is the lasagna bolognese with meat sauce, ricotta and mozzarella. 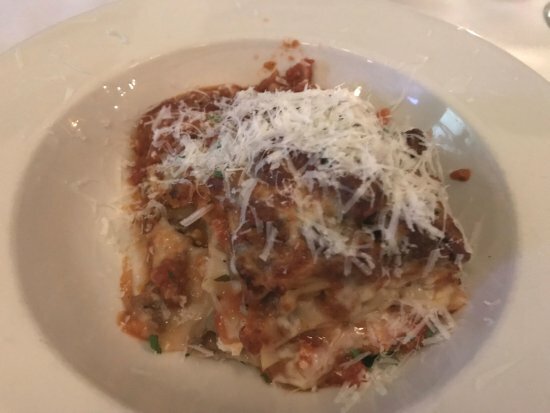 As the name suggests, it’s a large slab of meat lasagna slathered in bolognese sauce. 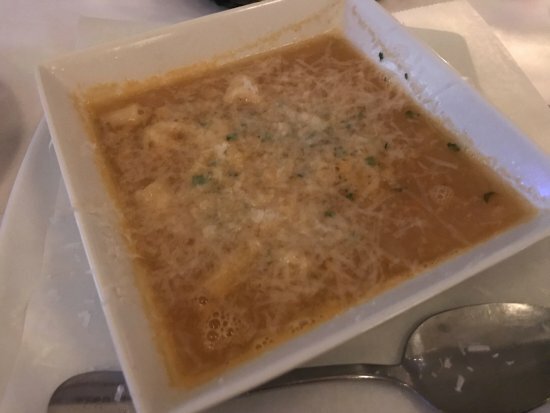 It’s a very heavy dish but the freshness of the tomatoes and the tenderness of the meat, blended in with a perfect mix of cheeses, makes it as hard to resist as the soup starter. Today will not be a day for light dining. Kurt had a role in Allen’s Midnight In Paris, years before last year’s explosion of coverage of the awful behavior of many people in the industry — although there had long been questions about Allen’s actions because of his decision to marry his adopted daughter Soon-Yi Previn. In 2014, Allen’s other adopted daughter Dylan first went public with claims her father sexually abused her when was seven. The writer-director has denied the allegations. But at the time of Midnight In Paris, the claims weren’t center stage. And rumors of Allen’s behavior were just that. “I knew some of both sides of the story and I assume everyone is lying and acting in their own self-interest. He’s fudging, she’s fudging, he seemed a little wild, she seemed a little not solid,” Kurt says — a position he took based on personal experience. He tells me about his wife Jessica Hendra, whose father is the English satirist Tony Hendra. He’s a bestselling author and “a horrible man, who sexually abused my wife from the ages of 6 to 13,” Kurt stays. I’m taken aback. 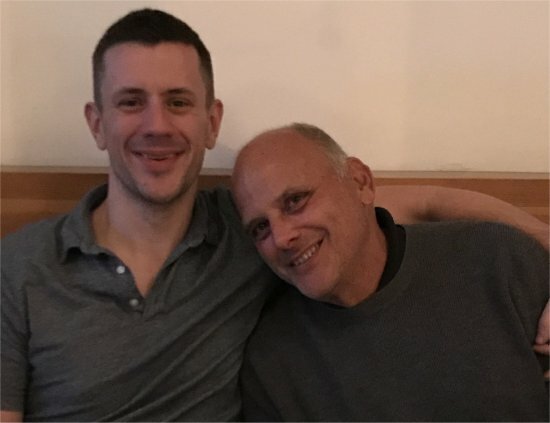 Kurt fills the silent air, telling me that Hendra would go on talk shows to discuss his incredibly popular memoir Father Joe, and that as part of the routine he’d share stories of how troubled his daughter was growing up and he didn’t know why. Jessica eventually gave the man an ultimatum to admit the truth or she would. He didn’t confess. And so she went to the New York Times with the story, and after that published a book about the allegations. “He told her, ‘We will never speak again on this earth,’ and they haven’t, which is fine with us,” Kurt says. 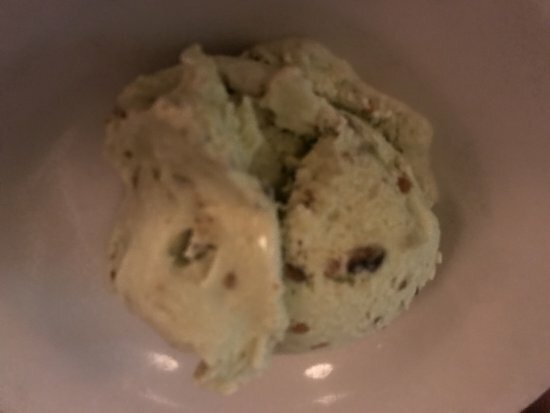 A momentary silence breaks when our waiter delivers dessert. And Kurt doesn’t even have to say a word, I can read the joking frustration on his face as the camera returns for some more photos. 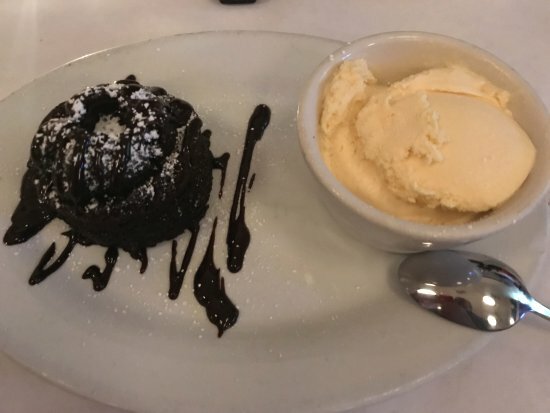 I snap what a think is a pretty decent picture of the chocolate molten lava cake he convinced me to get. “I know you can finish that,” he says with support. But the incredibly rich cake is what finally defeats me, and I’m unable to finish it. The camera goes away, and Kurt surveys the restaurant and (thanks to me) our vinegar and olive oil stained table. “I think we did well here,” he says with another smile. I tell him two hours have flown by. “It feels like four!” he jests back. As dinner comes to a close, I ask him if he’s proud of career. He corrects me instantly. “I’m not proud. I’m not in love with most of my work because I always think it could be better. And If you look at my professional life I really haven’t done much, some TV shows and movies,” he says. He’s being modest, IMBD alone lists almost 200 acting credits — many in well-known productions. “But in my personal life I’ve got a wife and two kids who love me and who are going to go on and do better things than I did,” Kurt adds. The Fullers as a unit are rising together. Stephen went in to audition and got the part. “And it worked better for Ned Ryerson,” Kurt says. “Stephen is innately goofier than I am, I would have been meaner and not as jolly. This was back when I would always come across as a little bitter, sharp and sarcastic” in his various roles, he adds. When he had children, things changed, and he credits them with taking him from “living in the dark to living in the light,” which helps explain his captivating, friendly personality. And that’s something he’s putting to good use in an increasingly diverse range of roles in his 60s. Psych, Heathers, The Truth About the Harry Quebert Affair and more prove that there are still roles that won’t play to prior typecasts. Demand remains for talented character actors like him, Stephen and others featured on this site including Fred Melamed, Jim Piddock and Michael Hitchcock. “I’ve worked with all those guys, and the only reason we’re working is because we’re really good, because you don’t get any favors. You don’t last a long time unless you know what you’re doing,” Kurt says.